Consumer electronics have witnessed a boom in the last half century. In this time period, computer microchips have become exponentially more powerful and some can even compute billions of operations per second. This sharp increase in processing power has allowed computer microchips to tackle incredibly complex tasks. Thus, we have entered the age of smart technology and artificial intelligence, where computers can now exhibit human levels of intelligence. Sadly, humans are increasingly becoming attached to technology and veering away from human to human interaction. However, humanity still wants to feel human-like interaction, hence the rise of one of the internet’s most popular products, the Amazon Echo Dot. At its core, the Echo Dot is imitating a person that can answer your every request, and achieves this by using Amazon’s voice service, Alexa. The parallel between speaking to a real human and Alexa is rather scary; a consumer can ask Alexa a question just as they would ask a person, and a second later, Alexa formulates a detailed answer just like a person would. On top of that, since it is connected to the internet, the Echo Dot can also control a variety of devices in the household, from lights to appliances to televisions. All this functionality comes at a deceivingly low cost of fifty dollars, and oftentimes even lower. But society fails to consider the true costs of technological products like the Echo Dot. The life cycle of the Amazon Echo Dot Dot consumes rare earth metals that are nearly impossible to recycle. Amazon will have to reconsider the materials they use to manufacture the Amazon Echo Dot within the next decade, or Amazon will have to stop production of the Echo Dot. Although Amazon is the maker of the Echo Dot, it is actually a combination of various companies working together to deliver a finished product. Essentially, the Echo Dot is a multitude of simpler finished products working together to make a final product. It is a combination of two circuit boards, a metal base plate, a speaker, and an outer plastic housing. The circuit boards are composed of different chips, including a digital media processor, SDRAM, flash memory, wifi and bluetooth chip, digital audio convertor, LED drivers, low-power stereo ADC, and dual positive-edge-triggered D-type flip flops. These all functionally perform different tasks, but they are all Silicon chips and use the same general materials to construct. Some of the companies that make these chips are Qualcomm, Samsung, and Micron, but the biggest manufacturer is Texas Instruments, who are responsible for half of the chips and semiconductors found in the Echo Dot. Manufacturers have to perform an extensive process to turn raw materials into silicon chips. It starts with polysilicon, which is derived from quartzite and coal. This quartz is mined from the earth, which uses fossil fuels to supply the energy to extract quartzite, along with every other metal used in production of the Echo Dot. The mined quartzite is then melted and crystallized, and drawn out in a long cylinder. Silicon wafers are then created from cutting this cylinder with diamond. Phosphorus is then added and a layer of glass, silicon oxide, is grown on the surface. Patterns are etched on the silicon wafer using photolithography, and the glass is removed where the pattern was etched. Boron and arsenic are then used to adjust the conductivity of the wafer. Since this entire process occurs on the microscopic level, necessary precautions must be taken in order to have functional microchips. Humans are covered from head to toe, so they won’t contaminate any of the chips, and the factories use extensive circulation systems to keep the air in the factories nearly a hundred times cleaner than a hospital. The silicon wafers are then distributed to specialized factories to turn the wafers into specific chips with different functions. The wafers then undergo different platings and chemical baths. The wafers are cleaned using sulfuric acid and hydrogen peroxide. To remove any unnecessary particles, ammonium hydroxide and hydrogen peroxide are used. Another contamination removal bath uses deionized water, hydrogen chloride, and hydrogen peroxide. Packing millions of transistors onto a small silicon wafer is a very precise process, so even a dust particle can destroy an entire chip, so each of these cleaning processes ensures that a dust particle will not contaminate the chips. All these contamination baths are part of the reason why computer chips use the most energy per kilogram to make, and why they use a multitude of materials that do not actually make up the Echo Dot. Even though silicon chips are the brains of the Echo Dot, they have to be connected in order to work together. This is where printed circuit boards are used. Generally, printed circuit boards are made of four distinct layers, which are laminated together using heat into one layer. “The material used in PCB from top to bottom includes Silkscreen, Soldermask, Copper and Substrate” (PCBCART). The substrate cards are assembled using surface wiring and other wiring throughout the card, which is largely made by copper. The components are placed into the holes and soldered into place. Soldering paste, made of tin and lead, connects the surface components, and the soldering paste is run through these holes. The printing blades spread the soldering paste on the stencil, running through the holes and covering the metallic surfaces of the printed circuit board, which establishes an electric current. Using precise machines, surface wiring elements are then installed. The most essential part of this process is in an oven where the heat solders the different components on the circuit board to the card. Humans then insert different circuit connectors through the card and into their respective holes. The metallic placement points are soldered to the card, done with a bath of molten tin-lead alloy at a very high temperature. In this process, there is also a minimal amount of silver and gold being used in the circuitry. The final product is a working circuit board that will be transported to a different factory to assemble the Echo Dot. Other smaller components are also vital to the Echo Dot, and not nearly as complex as the silicon chips or circuit boards inside the Echo Dot. For example, Alexa is able to speak to humans using a speaker in the Echo Dot. The speaker is manufactured using stamped iron or aluminum for the frame, iron oxide, strontium, ceramic for the magnet, copper wire, and adhesive glue. Another small component are light-emitting diodes, better known as LEDs used to indicate certain states of the Echo Dot. In order to create light, LEDs are made of aluminum, gallium, indium, copper, antimony, arsenic, nitrides, and phosphides. The housing for the LEDs are constructed from glass, silicone, steel, or fiberglass. Even this seemingly negligible component, in comparison to chips and the circuit boards, is expelling supplies of rare earth metals like antimony, gallium, and indium. Once all of these separate electronic components are made, they are shipped to Foxconn in China for the final stage of manufacturing, where each component will be put together to create a finished product. At Foxconn, the rest of the manufacturing process for the Echo Dot is done by hand and with soldering irons. The only other components not accounted for are the non-technological components. These include a metal base plate that serves as a weight and frame for the Echo Dot, a plastic housing to hide all the electronic components, a rubber bottom to prevent scratches, and screws in order to hold all the different components together. The metal plate is made of steel, which is an alloy composed of iron and carbon. The plastic housing is made of polymers, derived from materials like coal, gas, oil, and different minerals and plants. The rubber is either natural, made from latex which is grown from plants, or synthetically made, for example styrene butadiene or polyacrylics. Lastly, the screws are made of carbon and steel wire. A small amount of glue and more solde is used to hold all the small components together, resulting in a finished Amazon Echo Dot. Even though the Echo Dot may be fully constructed, it still has to be packaged and shipped to consumers. The Echo Dot is packaged with cardboard and paper, which uses trees as the raw material. These units are also shipped overseas from China to the United States and any other distributing centers across the world. This requires fossil fuels to transport the Echo Dots to carrier facilities, and more fossil fuels are expelled to ship the units to the buyer’s residence. Once the Echo Dot is in the buyer’s hands, there is no need for maintenance at any point in its lifetime. The only requirement is that it needs electricity to operate, so it must plugged into an outlet. The minimal amount of electricity used by the Echo Dot still needs to be taken into account, as more fossil fuels are converted to electricity for the consumer to use, unless the residency uses solar power. Once the Echo Dot reaches the end of its lifetime, the Echo Dot should be recycled and disposed of at appropriate electronic waste sites. Sadly, the vast majority of materials within the Echo Dot cannot be recycled; this includes all of the critical metals inside the device besides gold and silver, which can be recycled. This means that some of the rarest metals on earth, including indium, gallium, and antimony are wasted and unable to be reused. 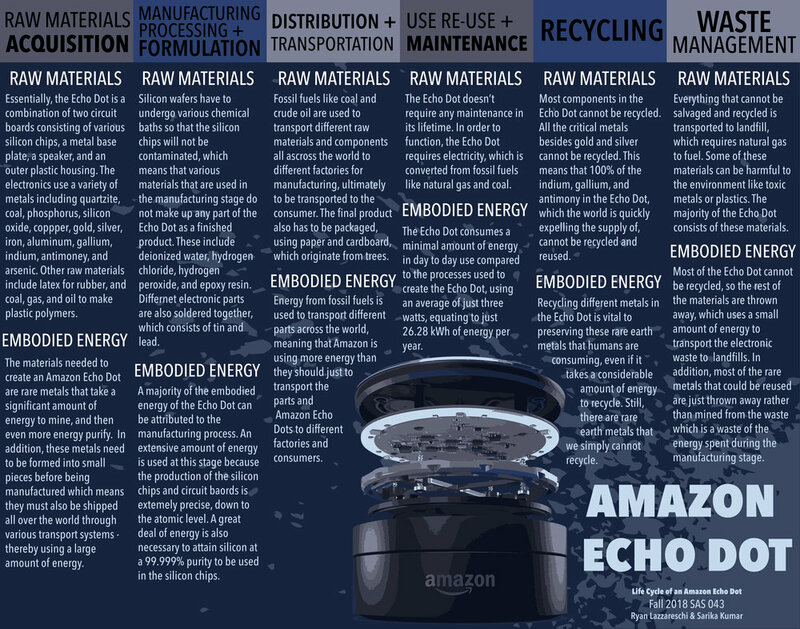 The rest of the Echo Dot, including the plastic housing, rubber bottom, and most of the electronic components are transported to landfills. This however is only one of the major issues regarding the life cycle of the Echo Dot. The biggest issue regarding the Echo Dot is debatably in the manufacturing stage. Manufacturing the Amazon Echo Dot comes at a widely unknown price, a price that cannot be described by a number. In the final stage of manufacturing, which is done by Foxconn, workers are oppressed and forced to work in harsh conditions. These factories exhibit “poor working conditions and high rates of suicide among its workers” (Weise). Amazon’s success has come at the expense of these Foxconn workers, who should not have to withstand these harsh conditions to supply Amazon with a viable amount of Echo Dots to sell to consumers. “China Labor Watch reported that up to 40% of its workforce has been made up of temporary workers, far exceeding a legal limit of 10%. These temp workers received inadequate safety training, weren’t paid extra for overtime and didn’t get paid sick leave, according to the report” (Roettgers). Workers are also subject to excessive overtime hours, some days even having to work fourteen hours straight. As this relatively recent Foxconn news is reaching the mass media, Amazon will have to change its working conditions for their manufacturing processes. Like most electronic devices, the Amazon Echo Dot uses a plethora of materials, ranging from some of the most abundant materials like wood to some of the rarest earth metals like indium and gallium. A majority of the materials that are used in the life cycle of the Echo Dot are found in the manufacturing process, since manufacturing silicon chips and circuit boards are very material intensive. At this rate though, Amazon will not be able to produce the Echo Dot within the next couple decades unless they find supplements for these critical metals soon. Amazon also needs to become more eco-friendly as most of the energy in the Echo Dot’s life cycle is supplied by fossil fuels, which are also depleting quickly. Amazon can be more environmentally friendly by switching from currently used nonrenewable energy sources to renewable energy sources. The most important issue that Amazon needs to settle as of right now though is the harsh working conditions that Foxconn employees face everyday in China. Amazon is far from perfect and even though they are dominating the online market with flagship products like the Echo Dot, Amazon must take the necessary measures to make sure they are an ethical and environmentally friendly company. “Amazon Echo Dot Teardown.” IFixit, 29 June 2017, www.ifixit.com/Teardown/Amazon Echo Dot Teardown/61304. “CN108550367A - Kinds of Portable Intelligent Voice Interaction Control Device, Method and System.” Google Patents, Google, 18 May 2018, patents.google.com/patent/CN108550367A/en?q=dot&oq=amazon echo dot. “DM3730, DM3725 Digital Media Processors.” Texas Instruments, Texas Instruments, July 2011, www.ti.com/lit/ds/symlink/dm3725.pdf. Dupzyk, Kevin. “Things Come Apart: The Amazon Echo.” Popular Mechanics, Popular Mechanics, 2 July 2018, www.popularmechanics.com/technology/gadgets/a25106/amazon-echo-disassembly/. Hughes, Mark. “Teardown Tuesday: Amazon Echo Dot v2.” All About Circuits, 1 Nov. 2016, www.allaboutcircuits.com/news/teardown-tuesday-amazon-echo-dot-v2/. Johnson, Bernadette. “How Amazon Echo Works.” HowStuffWorks, HowStuffWorks, 16 Nov. 2016, electronics.howstuffworks.com/gadgets/high-tech-gadgets/amazon-echo1.htm. Kinsella, Bret. “Apple HomePod Costs $216 to Manufacture.” Voicebot, 15 Feb. 2018, voicebot.ai/2018/02/15/apple-homepod-costs-216-manufacture/. “Light-Emitting Diode (LED).” How Products Are Made, www.madehow.com/Volume-1/Light-Emitting-Diode-LED.html. Lloyd, Craig. “How Much Electricity Does the Amazon Echo Use?” How-To Geek, How-To Geek, 10 Apr. 2018, www.howtogeek.com/348219/how-much-electricity-does-the-amazon-echo-use/. “OK Google, How Much Energy Does Alexa Consume?” OK Google, How Much Energy Does Alexa Consume? | E Source, 20 Feb. 2017, www.esource.com/es-blog-2-17-17-voice-control/ok-google-how-much-energy-does-alexa-consume. “PCB Materials.” PCB Manufacturing Process – A Step by Step Guide | PCBCart, www.pcbcart.com/pcb-capability/pcb-materials.html. Roettgers, Janko. “Amazon Criticized Over Working Conditions at Echo Factory.” Variety, Variety, 11 June 2018, variety.com/2018/digital/news/amazon-echo-foxconn-working-conditions-1202840512/. “Screw.” The Columbia Encyclopedia, 6th Ed, Encyclopedia.com, 2018, www.encyclopedia.com/science-and-technology/technology/technology-terms-and-concepts/screw. “Stereo Speaker.” How Products Are Made, www.madehow.com/Volume-7/Stereo-Speaker.html. Swearingen, Jake. “Amazon Could Give the Echo Dot Away and Still Make Money.” Intelligencer, 3 Jan. 2018, nymag.com/intelligencer/2018/01/amazon-could-give-the-echo-dot-away-and-still-make-money.html. “TPS65910xIntegratedPower-Management Unit TopSpecification.” Texas Instruments, Texas Instruments, Oct. 2014, www.ti.com/lit/ds/symlink/tps65910.pdf. Weise, Elizabeth. “Amazon's Echo Dot, Kindles Made in Foxconn Factory Rife with Labor Abuses, Rights Group Says.” USA Today, Gannett Satellite Information Network, 12 June 2018, www.usatoday.com/story/tech/talkingtech/2018/06/11/amazons-echo-dot-kindles-made-factory-where-workers-were-abused/690175002/. “What Are Plastics?” Plastics Make It Possible, 29 Oct. 2018, www.plasticsmakeitpossible.com/about-plastics/types-of-plastics/what-are-plastics/. Williams@wwwdotandrew, Andrew. “How Much Power Does Your Smart Home Tech Really Use?” The Ambient, 28 Feb. 2018, www.the-ambient.com/features/power-smart-home-tech-yearly-cost-374. The Amazon echo dot is the latest edition to Amazon’s line of Echo products. These voice- controlled devices that can tell you the weather, news, sports scores and more, are made up of varying plastics and metals with a variety of synthetic materials. Overall, the Silicon Era has a much higher focus on creating nano technology and the only reason it has been able to sustain itself thus far is due to cheap sources of energy. As we scale down in size as a focus of manufacturing, there is an exponential increase in the amount of energy used in production. However, the cost of these nanotech items that contain small chips, like cell phones, laptops and speakers, are not kept around as long as larger scale items. So the amount of energy put into manufacturing this technology and its overall life cycle is not equivalent to its price — unlike a few thousand dollar car or refrigerator. Most of the embodied energy used in the production of the Amazon Echo Dot comes from the nanotech inside the speaker rather than the thin plastic encasing which is practically universal to most tech devices. The size of the products inside of the Amazon Echo Dot might be small, but each piece is highly detailed and takes a plethora of various processing devices and steps to form. This inner technology is built using highly processed materials which use a massive amount of energy, thus the general lifecycle of the Amazon Echo Dot wastes a significant amount of energy to manufacture because of the wasteful lifecycle of the product. When writing a paper of this sort, we tend to think that all sources about energy and information relating to the product must come directly from the company source. However, most speakers don’t vary much in their technology. The Amazon Echo Dot is no exception. The Dot is essentially the portion of the Amazon Echo without the speaker underneath it. Eliminating the big speaker that the Echo is known for drops the price of the Echo Dot from $180 to $50. The Echo Dot itself does have its own speaker, but the purpose of this speaker is not necessarily for music but for the voice of Amazon’s smart voice Alexa. The Dot is made up of basic materials commonly found in other speakers on the market of the same class. Basic Torx head screws are hidden by a simple rubber pad that hold a plastic case covering up the circuit board and top half of the device. This plastic case is made in China and then shipped to a different manufacturing facility to be fully assembled (Teschler). The circuit board contains a Texas Instruments chip called the TLV320DAC3203 which is manufactured in Houston, Texas — not far from the TI headquarters (Teschler). Other visible pieces include a ribbon cable connecting the board to a second piece that hold the user buttons, microphones, and LED lights. The circuit board just balances in position, so after removing the cable you can see the other side of the board. This side of the board contains four main chips — three of the chips manufactured by MediaTek in Taiwan (Teschler). Together, these four chips are the quad-core ARM processor, a power management chip, a four gigabit DRAM, as well as a chip that handles WiFi, Bluetooth, FM, and GPS. The DRAM chip, is manufactured by Micron and is commonly found in smartphones. Therefore, the totally embodied energy of an Echo Dot must be approximately equivalent to that of a basic $50 smart phone or similar speaker (Teschler). The problem with the Echo Dot being incredibly cheap to buy, is that the amount of energy put into manufacturing the Dot is far less equivalent than its price. “The energy used to produce electronic gadgets is considerably higher than the energy used during their operation. For most of the 20th century, this was different; manufacturing methods were not so energy intensive. An old fashioned car uses many times more energy during its lifetime (burning gasoline) than during its manufacture. The same goes for a refrigerator or the typical incandescent light bulb: the energy required to manufacture the product pales into insignificance when compared to the energy used during its operation”. As aforementioned, the size of the products inside of the Amazon Echo Dot might be small, but each piece is highly detailed and takes a plethora of various processing devices to form. Each chip is finely detailed with thin copper wires and inlaid with complex circuits. To create chips like these takes energy-intensive machinery because of the need for extremely effective air filters and air circulation systems. In addition, when building pieces as delicate as these the need for a highly sterilized environment becomes important because a single speck of dust could destroy the circuit. And as DeDecker remarks “For the same reason, the manufacture of microchips requires the purest silicon” which once again takes a high amount of energy to both harvest and purify. Computers, cellphones, speakers and other devices of the like are designed for obsolescence and continuous upgrades. For example, every year Apple release a new iPhone leading millions of their customers to throw away their current iPhone in lieu of the new one. This goes for laptops as well as every other phone and speaker causing vast amounts of electronic waste every year. Basically, the lifecycle of most tech gadgets is extremely short. A a staff member at the magazine Gaia says, “Upgrading to the latest computer or cell phone model has become habit for us and it’s one that is actively encouraged by the companies manufacturing our devices”. This is known as planned obsolescence. Planned obsolescence takes place in many ways. The gadget might fall apart, a newer model is released, but rather than repairing the broken device because that repair is nearly as expensive as buying a new one, the easier option is just to buy newer version of the device all together. For example, Amazon released its first smart speaker known as the Amazon Echo in 2014. Since then, it has not only released the Amazon Echo Dot in 2017, but it has also released 3 versions of the dot in the last one year — all of which have shot up in sale count. So the amount of energy it took to manufacture each version is completely wasted because the consumer buys the newer version of the speaker soon after its release. This kind of product takes a large toll on the environment because each tech gadget or speaker requires a large number of rare earth elements, flame retardants, and chemicals to manufacture and function the way they do. Each of these materials have significant environmental impacts from both the initial mining stage to their end disposal. A good example of this is the embodied energy of a computer which has the same basic chip as the Echo Dot does. A study from 2004 concluded that while the ratio of fossil fuel use to product weight is two to one for most manufactured products, the ratio is twelve to one for a computer (DeDecker). Essentially, the total energy use of a computer is dominated by production as opposed to operation which is the same for any product that has chips like those in a computer (DeDecker). Because of the inner technology of the Amazon Echo Dot also contains these chips, this shocking statistic goes for the Echo Dot as well. Energy from fossil fuels is used to transport different parts across the world, meaning that Amazon is using more energy than they should just to transport the parts and fully assembled Echo Dots to different factories and consumers. The reports released by HP, Apple, and other companies of the like only release the carbon footprint information pertaining to the use of the object rather than the embodied energy throughout the entire lifecycle of the product that would include manufacturing, recycling, transportation and distribution of the product. However, these numbers provide good reference in comparing the Amazon Echo Dot’s energy usage during its consumer use to other products of the like. Generally, the carbon footprint of tech companies is published on a yearly basis. Simply put, the carbon footprint is the sum of all emissions of carbon dioxide (CO2) which were induced by activities in a given time frame. Essentially, it is the total amount of greenhouse gases produced to directly and indirectly support human activities and is expressed in equivalent tons of CO2. For example, in the year 2017, HP reported 37 million tons of CO2 emissions in printer production which approximates to about one ton of CO2 per printer(Sustainable). On the other hand, in the year 2017, Apple reported 27.5 million tons of CO2 emissions in total Apple product production(Gonzalez). This narrows down to about 79kg of CO2 for each iPhone X, 68kg of CO2 per iPhone 8 Plus, and 57kg of CO2 per iPhone 8 and so on(Gonzalez). However, although Amazon is one of the few large corporations that refuses to release their carbon footprint information to the public, the Echo Dot consumes a minimal amount of energy in day to day use compared to the processes used to create the Echo Dot, using an average of just three watts, equating to just 0.305914kg of energy per year (Hughes). “While it is fairly easy to obtain figures regarding the energy consumption of electronic devices during the use phase,... is it surprisingly hard to obtain reliable and up- to-date figures on the energy consumed during the production phase. Especially when it concerns fast evolving technologies. A life cycle analysis of high-tech products is extremely complex and can take many years, due to the large amount of parts, materials and processing techniques involved. In the meantime, products and processing technologies keep evolving, with the result that most life cycle analyses are simply outdated when they are published”. The lifecycle of a product does not just end with the user’s recycling of it. Although tech gadgets like the Amazon Echo are recycled, the multitude of elements used to produce the products can leach into the earth and pollute soil and water sources because they are not properly recycled. It is estimated that roughly 50 million tons of e-waste are generated globally every year, containing parts valued approximately $55 billion(Gaia). The primary materials used to create the chips in the Amazon Echo Dot consist of mercury, lead, hexavalent chromium, cadmium and many others. Some of these materials are carcinogenic, while others cause particular diseases as well as nervous system damage. In many countries it has become common to burn e-waste, “letting plastics and invaluable material melt off, until the precious metals inside an be extracted”(Gaia). The major problem with this process is that it releases toxic fumes into the air with no regulation from the government or other agencies. In addition, recycling different metals in the Echo Dot is vital to preserving the rare earth metals that are being used in manufacturing, even if it takes a considerable amount of energy to recycle. Still, there are rare earth metals that we simply cannot recycle — most of the Echo Dot cannot be recycled, so the rest of the materials are thrown away, which uses additional energy to transport the electronic waste to landfills. In addition, most of the rare metals that could be reused are just thrown away rather than mined from the waste which is a waste of the energy spent during the manufacturing stage. With the production of any tech gadget that has a chip included, the manufacturing process automatically becomes the part of the life cycle that uses most of the embodied energy of the entire product. Although the plastic surrounding the tech inside the Dot is fairly common and does not take as much energy to harvest and then manufacture, the total embodied energy in creating a speaker like this is massive. From the first step of harvesting the primary materials, to the manufacturing of the chips, to the distributing and worldwide shipping of each product, and lastly, to the “recycling” of each of Amazon Echo Dot, the energy footprint is insurmountable. The nano and micro technology used and manufactured in and for the Amazon Echo Dot is constantly upgraded leading to the wasteful lifecycle of throwing away a speaker each year to get the newest edition which leaves a massive amount of electronic waste and a damaging energy footprint on the environment. If Amazon keeps up this trend of releasing multiple new products within such a short time period, eventually the outside natural environment will run out of resources and be unable to keep up with their innovation, as well as consumer energy waste. Amazon needs to start thinking in the longterm about how to reuse and properly recycle chips and other precious materials so that the energy spent on the manufacturing process becomes equal to the amount of energy spent during the products lifetime with the consumer. Alternatively, Amazon can consider raising the prices of their Amazon Echo’s to match that of the energy spent during the manufacturing process of the product’s lifecycle. 2017 Sustainable Impact Report. HP, 2017, www8.hp.com/h20195/v2/GetPDF.aspx/ c05968415.pdf. “AWS & Sustainability.” Amazon, Amazon, aws.amazon.com/about-aws/sustainability/. Biggs, John. “Digging Deeper into Smart Speakers Reveals Two Clear Paths.” TechCrunch, TechCrunch, 9 July 2018, techcrunch.com/2018/07/09/digging-deeper-into-smart-speakers- reveals-two-clear-paths/. “CN108550367A - Kinds of Portable Intelligent Voice Interaction Control Device, Method and System.” Google Patents, Google, 18 May 2018, patents.google.com/patent/ CN108550367A/en?q=dot&oq=amazon echo dot. Dupzyk, Kevin. “Things Come Apart: The Amazon Echo.” Popular Mechanics, Popular Mechanics, 2 July 2018, www.popularmechanics.com/technology/gadgets/a25106/amazon- echo-disassembly/. Dvorak, Paul. “Amazon Has Launched 18 Wind and Solar Projects across the U.S. More to Come.” Windpower Engineering & Development, 25 Oct. 2017, www.windpowerengineering.com/business-news-projects/business-issues/amazon-launched-18- wind-solar-projects-across-u-s-come/. Eco Solutions. HP, 2017, www8.hp.com/h20195/v2/GetPDF.aspx/c05968416.pdf. González, Ángel. “Amazon Gets an 'F' from the Carbon Disclosure Project.” The Seattle Times, The Seattle Times Company, 1 Nov. 2016, www.seattletimes.com/business/amazon/ amazon-reluctant-to-share-carbon-emissions-data/. Gunther, Marc. “Can Amazon's New 'Dream Team' Fix the Company's Sustainability Reputation?” The Guardian, Guardian News and Media, 2 Feb. 2016, www.theguardian.com/ sustainable-business/2016/feb/02/amazon-sustainability-edf-epa-best-buy-walmart-apple- microsoft-csr-child-labor. “How Loudspeakers Work.” Explain That Stuff, 4 July 2018, www.explainthatstuff.com/ loudspeakers.html. Lloyd, Craig. “How Much Electricity Does the Amazon Echo Use?” How-To Geek, How- To Geek, 10 Apr. 2018, www.howtogeek.com/348219/how-much-electricity-does-the-amazon- echo-use/. “OK Google, How Much Energy Does Alexa Consume?” OK Google, How Much Energy Does Alexa Consume? | E Source, 20 Feb. 2017, www.esource.com/es-blog-2-17-17-voice- control/ok-google-how-much-energy-does-alexa-consume. Platt, John. “Is Amazon Prime Eco-Friendly or Wasteful?” MNN - Mother Nature Network, Mother Nature Network, 27 Apr. 2018, www.mnn.com/money/sustainable-business- practices/stories/is-amazon-prime-eco-friendly-or-wasteful. Swearingen@JakeSwearingen, Jake. “Amazon Could Give the Echo Dot Away and Still Make Money.” Intelligencer, 3 Jan. 2018, nymag.com/intelligencer/2018/01/amazon-could- give-the-echo-dot-away-and-still-make-money.html. Teschler, Lee. “Teardown: Inside Amazon's Echo Dot.” Microcontroller Tips, 5 Jan. 2018, www.microcontrollertips.com/teardown-inside-amazons-echo-dot/. Weise, Elizabeth. “Amazon's Echo Dot, Kindles Made in Foxconn Factory Rife with Labor Abuses, Rights Group Says.” USA Today, Gannett Satellite Information Network, 12 June 2018, www.usatoday.com/story/tech/talkingtech/2018/06/11/amazons-echo-dot-kindles-made- factory-where-workers-were-abused/690175002/. “What Is a Carbon Footprint.” Time for Change, timeforchange.org/what-is-a-carbon- footprint-definition. Wilner, Tamar. “Intel Sustainability Report: GHGs Per Chip Up 48%.” Environmental Leader, 6 June 2013, www.environmentalleader.com/2013/06/intel-sustainability-report-ghgs- per-chip-up-48/.